The Pod Hotels today announces the opening of its flagship property, Pod Times Square, right in the center of New York City’s hustle and bustle. 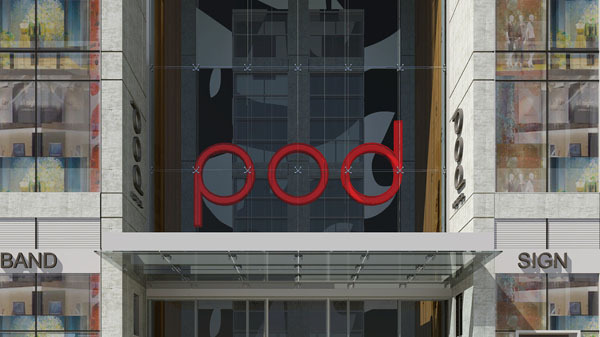 A BD Hotels property (The Mercer, The Marlton, The Bowery, The Maritime, The Greenwich), Pod Times Square becomes the fifth asset in the Pod Hotel collection following the great success of Pod 51 and Pod 39; Pod BK, the first property in an outer-borough; and Pod DC, the first property outside of New York City. The innovative hotels’ proven micro-model boasts the highest percentage of occupancy across the entire BD Hotels portfolio. Pod Times Square will be the biggest Pod to date and will offer accommodations that are a first for the Pod Hotels brand: micro-apartments. 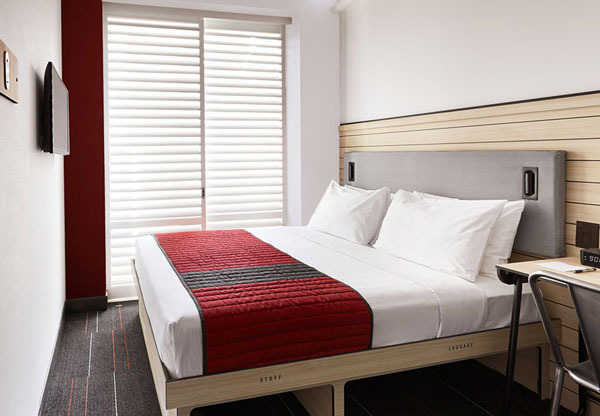 Located in the heart of Times Square, on the corner of 42nd street and 9th Avenue, Pod Times Square expands on the micro-hotel concept, offering 45 Pod Pads – living suites varying from 600 – 800 square feet, available for those interested in extended-stay options or even long-term leases. Exclusively available for Pod Pad tenants, the property provides a fitness center and guest lounge on the top floor boasting views of the city’s west side and Hudson River. As guests enter the hotel through the 60-foot-tall vestibule made entirely of glass, they are then whisked up to the third-floor lobby in a glass enclosed elevator. Guests can take in the uniquely designed elevator shaft featuring a witty mural by Brooklyn native artist JM Rizzi, most notable for composing magical symphonies of shapes and forms, all pulsating into one another. Guests, tenants, and locals alike can enjoy cocktails and cuisine in either of the hotel’s two Major Food Group concepts: a brand new Tiki Bar that will be located in the third-floor lobby, with generous outdoor space overlooking New York City’s pulse of Times Square, as well as Parm, the group’s famous casual Italian-American restaurant (this will be the sixth location), located in the hotel’s ground floor space. 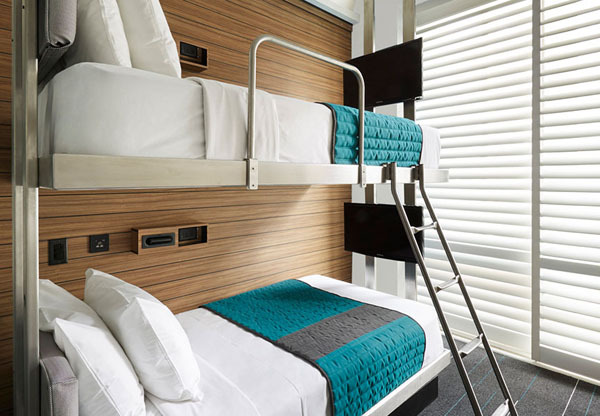 Across 28 floors, 665 rooms – in addition to the 45 Pod Pads – each about 115 square feet, include queen and bunk bed configurations, with features like built-in storage and high-tech amenities allowing guests to stream media content from smartphones or other devices. Pod Times Square has appointed Paul Kashman as General Manager of the property who will oversee all aspects of hotel operations. Kashman brings a wealth of managerial knowledge to his new role from previous hospitality experience including his roles as General Manager of The OUT NYC Hotel, Director of Front Office Operations of Denihan Hospitality Group, Director of Front Office of The Standard, High Line, and more. Pod Times Square will be a hop, skip, and a jump away from lively Hell’s Kitchen neighborhood, which offers some of New York City’s best cuisine, as well as trendy bars and nightlife. A short walk to the Time Square subway hub, guests and tenants can explore all of what the city has to offer in its convenient location.